A previous post noted an article by this blog's author on china.org.cn demonstrating that for the first time for a century and a half the US had lost its position as the country producing, in gross dollar terms, the greatest amount of finance for investment - i.e savings. The US has been overtaken by China. In short the world's number one capitalist economy no longer produces the most capital. The New York Times noted this as Newsweek did later. The 3rd quarter US GDP figures published this week however confirm another extremely striking statistic, this time concerning net creation of capital - that is savings minus capital consumption. This shows that in net terms the US, the world's number 1 capitalist economy, is currently producing no capital at all - currently US capital consumption exceeds capital creation. The US is at present subtracting from the world's stock of capital not adding to it. This situation shows how deep has been the impact of the financial crisis on the US. The open visible wounds are the recession and rapidly rising unemployment, but hidden financial injuries under the skin of the US economy appear more serious. The factual situation is shown in Figure 1. This illustrates US gross saving compared to capital consumption. As may be seen US saving, that is capital creation, has been declining for a prolonged period but had hitherto since World War II had remained above the level of US capital consumption. The impact of the financial crisis has however driven US saving precipitately downwards. The Bureau of Economic Analysis statistics show US gross savings in the 3rd quarter of 2009 were $1.483 trillion or 10.4% of GDP. US fixed capital consumption was $1.852 trillion or 12.9% of GDP. Even given that saving and capital consumption are among the harder figures in GDP to compute the $369 billion gap leaves no doubt that at present the US is consuming more capital than it is creating. In net terms, the world's number 1 capitalist country is simply not creating any capital. While there is no precedent in the last 150 years for the US falling behind another country for gross creation of capital, as has now occurred with China, there is actually one for the US consuming more capital than it creates. But this comparison illustrates strikingly the significance of the present situation of the US economy. The previous period when the US was literally creating no capital in net terms was in the depth of the Great Depression in 1931-34. 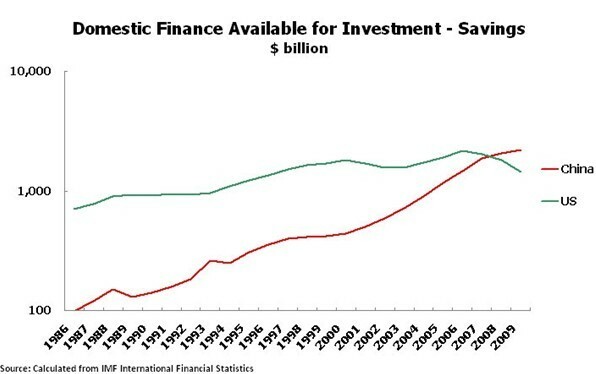 This trend is shown in Figure 2 which shows US net saving/capital creation - i.e. gross saving minus capital consumed. As may be seen for four years during the worst period of the Great Depression the US consumed rather than created capital. In every post-World War II recession prior to the present one however, even at the worst point of the downturn, the US remained a net capital creator - US gross saving exceeded US capital consumption. Net consumption of capital however reappeared in 2008 after 74 years, that is for the first time since 1934, and the situation significantly deteriorated during 2009. Such trends show even more strikingly than the scope of the the fall in production that the current US downturn is something quite different to even a severe normal cyclical downturn. The fundamental financial heart of the US, its simple ability to generate capital, has been deeply damaged. It is evident that such a situation whereby the US is a net consumer of capital cannot last for a prolonged period. It means, first, that currently the US is entirely dependent on flows of finance from abroad for capital accumulation. Second, it is hard for the US to overcome the present situation. Due to financial factors, and the increasing speed of technological progress, consumption of fixed capital, that is its obsolescence and wearing out, tends to increase slowly with time - it has risen from 10.2% of US GDP in 1950 to 12.9% of US GDP currently. It is almost impossible to lower the rate of capital consumption - which means that the US has to save 12.9% of GDP simply to maintain existing capital stock at a constant level. Finally, capital investment is the most important overall input into US economic growth - accounting for more than 50% of US growth throughout the period since World War II. A situation where the rate of capital formation in the US is severely depressed, therefore, will lock the US economy into a pattern of low growth - given such data the anemic US 3rd quarter growth figures, which at 2.8% were far lower than any usual US recovery, are unsurprising and will continue. As long as the above situation continues the US will remain, at best, on a low growth trajectory. Such trends are inevitable when the world's number one capitalist economy, as a statement of fact, is simply not creating capital. The author of this blog has an article at china.org.cn analysing the pattern of China's trade and the exchange rate of China's currency - the RMB. This shows that the view that an increase in the RMB's exchange rate would lead to a shrinking in China's trade surplus, a position put forward by the US administration and others, is factually wrong. That the increase in the RMB's exchange rate after 2004 led to an increase and not a shrinking of China's trade surplus. This is shown in Figure 1 below. The article examines the reasons for this trend. They are found in the fact that China's exports and imports do not move separately. The conclusions from this are not that the RMBs exchange rate should not increase with time. This will inevitably occur due to the increasing productivity of China's economy. But it shows that any rapid increase in the RMBs exchange rate would be not only damaging to China's exporters but also to other countries. Readers wishing to look at the issue in greater detail are referred to the full article. 1. Evidently extraordinary increase in the RMB's exchange rate can purely abstractly be postulated that would almost bring China's exports to a halt (i.e. demand for China's exports is not infinitely inelastic) and lead to reduction of the the trade surplus via huge simultaneous fall in its exports and imports. Such shifts, which mean a huge slowing of China's economic growth and imports under conditions of world recession would be far more damaging for the world economy than China's trade surplus! There is an interesting game called 'when will China overtake the US to become the world's largest economy'? Mechanical projection of existing growth rates gives the answer 2018. Goldman Sachs, arguing that some slowing of China's economy will take place, gives the answer 2026. What is not generally realised is that China passed a decisive financial landmark this year when it overtook the US as the world's largest generator of finance available for investment. As China has overturned a lead that the US has enjoyed for almost a century and a half - with only a brief interlude at the peak of Japan's bubble economy - this may be termed a turning point in world financial history. To set out the data starkly, the official US Bureau of Economic Analysis measured combined US company, government, and domestic savings in the second quarter of 2009 - the latest available figures- at an annualised $1.4 trillion. China does not publish quarterly savings figures, but it is relatively easy to calculate them from other published data. At official exchange rates, which understate the real size of China's economy, China's finance available for investment, that is savings, reached an annualised $2 trillion in the second quarter of 2009. This more than $600 billion lead over the US is sufficiently large that, even allowing for a generous margin of error given the indirect way China's figures must be calculated (aggregating fixed investment, inventories, and the balance of payments surplus), there is no doubt that China has now overtaken the US as the world's greatest domestic generator of capital. A lead the US has enjoyed over every competitor almost uninterruptedly since it passed Britain to become the world's largest economy in the 19th century has disappeared. That is why it may be legitimately said that a new era in world finance has begun. Two processes explain why the shift took place this year. As can be seen from Figure 1 China had been closing the gap with the US for many years. However, purely on previous trends, it would have taken China the better part of a decade to overtake the US. The new factor was the damage done to the internal structure of the US economy by the international financial crisis. Just as when the iceberg struck the Titanic the damage caused was worse below the waterline than above it. The visible damage from the financial crisis is the US recession and rising unemployment. The damage below the waterline, from which it will be much harder to recover, is the extraordinary fall in the already low US savings rate - in other words, the ability of the US to generate domestic capital. Total US savings, at annualised rates, have fallen from their peak of $2.2 trillion dollars in the third quarter of 2006 to $1.4 trillion. Expressed as a percentage of GDP the drop is from 16.2 percent to 10.2 percent. The latter figure is the lowest since 1934. US savings have therefore fallen to levels last seen in the midst of the Great Depression. Equally striking, the level of US investment (14.7 percent of GDP) is scarcely above its calculated rate of capital consumption (12.9 percent of GDP) – which means that, in net terms, the US is scarcely accumulating capital. Such an extraordinarily low investment rate precludes a rapid rate of recovery from the economic downturn. US economic growth following the recession will therefore be relatively anaemic compared to previous downturns. China will meet its 8 percent GDP growth target for this year and is likely to see still higher growth in 2010 – cutting the gap between the size of the Chinese and US economies by around three quarters of a trillion dollars in 2009-2010 alone. None of this, of course, means that China is about to eclipse the US. Even when China's economy becomes as large as that of the US, it will still only have reached one quarter of the GDP per capita. And China's overall institutional economic strength – as measured by the size of its companies, the proportion of its economy devoted to research and development, the organisation of its markets, its ability to handle very high value production, its ability to run companies abroad – still remains considerably weaker than that of the US. One of the great merits of China's economic leadership is that it does not conceal such facts and engage in self-delusional braggadocio, but openly addresses them. But all these necessary skills can be acquired with time and effort. China's underlying financial strength means it is well able to sustain its leading companies as they move up to world standards. The first international efforts of what are now world-beating firms from Japan and South Korea, such as Toyota and Samsung, were far more primitive than those of present Chinese companies such as Haier, Hisense, or Chery. Such underlying financial strength also gave China the ability to launch its stimulus package–the speed and decisiveness of which enabled China to achieve its 8 percent growth rate target. Financial strength will also allow the inevitable rough edges of such a huge package to be overcome. And that is why those who point to this or that inevitable individual problem have really lost the main plot. No country in the world could deliver a program on such a scale without encountering problems in some areas, as well as greater than expected successes in others. China's underlying financial strength allows any particular problems, such as some inevitable rise in bad loans, given the huge expansion of lending, to be mopped up with the resources generated by rapid economic growth. This is why the problems connected with China's stimulus package have been far less than those seen in the US. Finally China's underlying financial strength is why, in the international debate on China's economic stimulus package, those who have been predicting failure, such as Stephen Roach of Morgan Stanley or Michael Pettis of Peking University, have been consistently proved wrong by the unfolding economic data, while the views of those who have been predicting success, such as Professor Danny Quah of the London School of Economics, the present author, or Jim O'Neill of Goldman Sachs have been vindicated by events. In China it is always necessary to see the big picture. This article is a slightly edited version of one which originally appeared on the website china.org.cn.